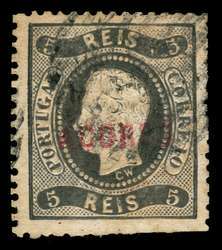 Scott #7, 1868 5r black, type I. Used F-VF with typical scissor separation. Scott 2015 $30. Scott #10, 1868 25r rose. Mint VF, no gum. Typical scissor separation. Scott 2015 $50. 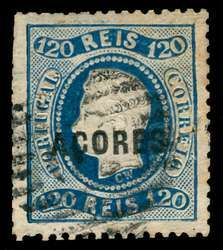 Scott #14, 1868 120r blue. Used VF with typical scissor separation. Scott 2015 $130. 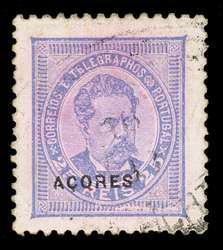 Azores Scott #15, 1868 240r Lilac. Mint Fine, no gum. Signed "J. SCH" (Schlegel). 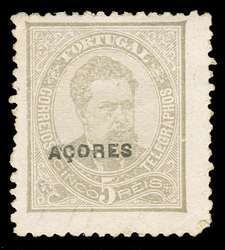 Very scarce stamp in reasonable quality. (Scott 2003 $575). Scott #21, 1871 5r black. Used F-VF with a couple blunt perfs. 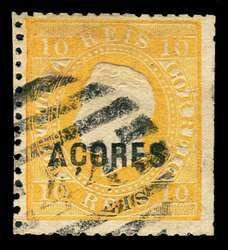 Scott #23, 1871 10r yellow. Used Fine with typical scissor separtaion. Scott 2015 $25. 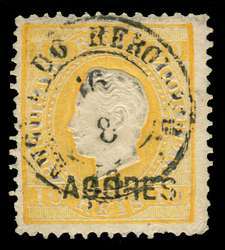 Scott #23e, Type C Overprint, 1871 10r yellow. Used F-VF with VF cancel. 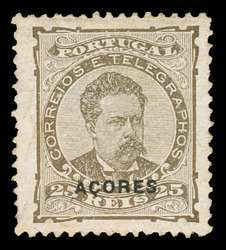 Scott #24g, Type C Overprint, 1871 20r bister. Used VF with couple nibbed perfs. Scott 2015 $12.50. 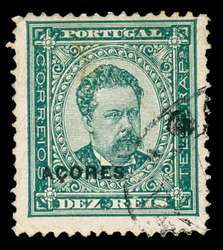 Scott #26, 1871 50r green. Mint F-VF. 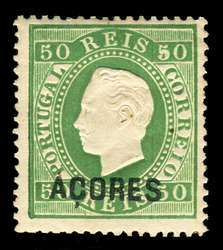 Scott #26, 1871 50r green. Used F-VF with slight toning on back. Scott 2015 $42.50. 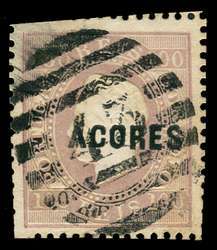 Scott #28, 1871 100r lilac. Used VF with typical scissor separation. Scott 2015 $60. 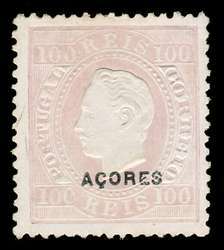 Scott #28c, Type C Overprint, 1871 100r lilac. Used Superb. 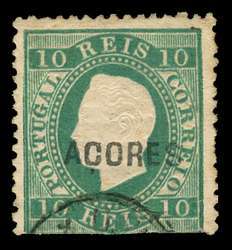 Scott #31, 1875 10r blue green. Used Spacefiller. Scott 2015 $125. 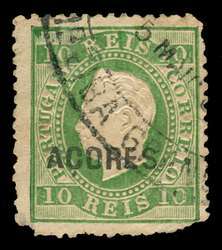 Scott #32, 1875 10r yellow green. Used Spacefiller. Scott 2015 $125. 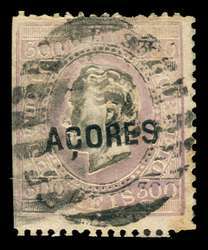 Scott #33b, 1875 15r lilac brown. Used VF with typical scissor separation. Scott 2015 $18. 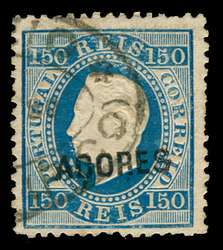 Scott #35, 1875 150r blue. Used F-VF with a few blunt perfs. Scott 2015 $175. 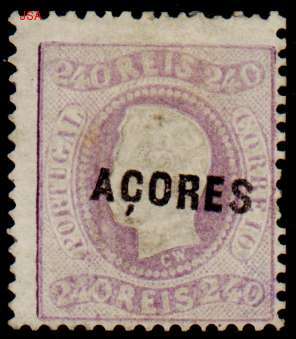 Scott #37, 1875 300r violet. Used Ave with couple short perfs and typical scissor separation. Scott 2015 $65. Scott #38, 1880 25r gray. Used Fine with one thin perf tip and typical scissor separation. Scott 2015 $95. 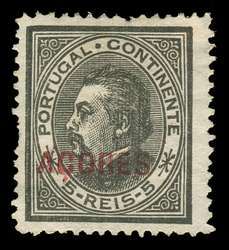 Scott #40, 1881 5r black. Mint F-VF, no gum. Few nidded perfs. Scott 2015 $29. 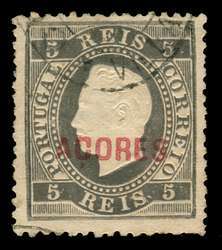 Scott #44, 1882 5r Light Gray. Mint Fine, no gum. Scott 2015 $19. 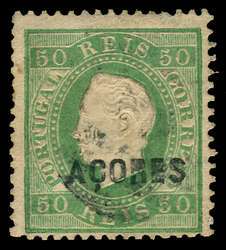 Scott #45, 1882 10r green. Used F-VF. 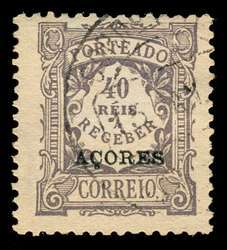 Scott #48, 1882 20r carmine. Used Fine. 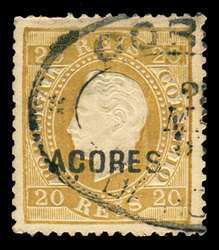 Scott #50, 1882 25r brown. Mint F-VF, no gum. Faint thin. Scott 2015 $30. 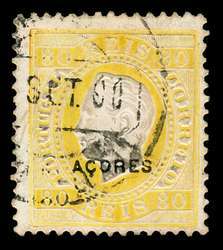 Scott #53, 1882 80r yellow. Used F-VF+. 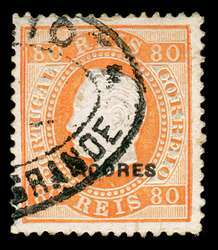 Scott #53a, 1882 80r orange. Used VF+. Outstanding example! 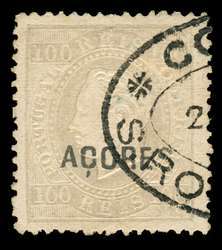 Scott #54, 1882 100r lilac. Mint VF, no gum. Scott 2015 $125. 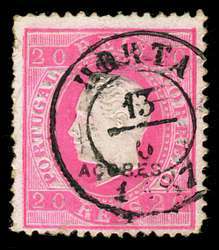 Scott #61, 1887 20r pink. Used Fine with small internal chipping. Scott 2015 $19. 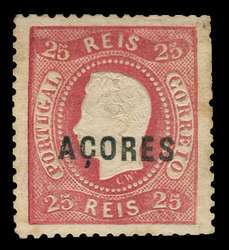 Scott #63, 1887 25r red violet. Used VF+. 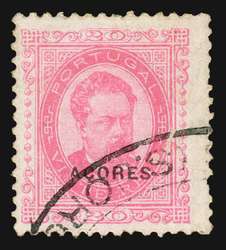 Scott #63, 1887 25r red violet. 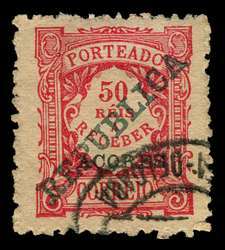 Used VF with Superb on-the-nose Ponta Delgada cancel. 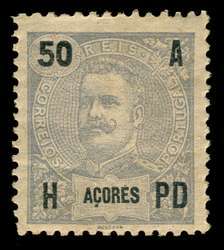 Scott #65-77, 1894 Prince Henry the Navigator. 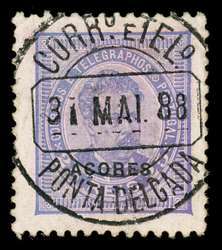 Used F-VF/VF with Superb cancels. #66 has margin faults. Some have minor toning from hinging. 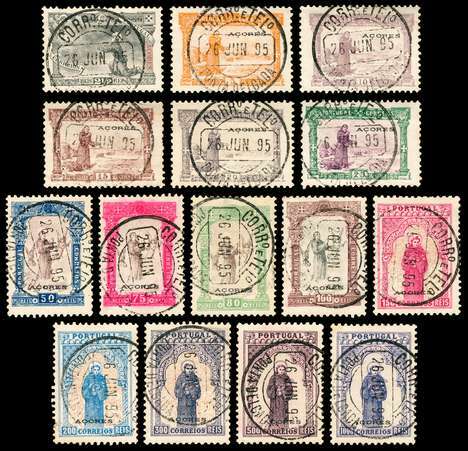 Scott #78-92, 1895 St. Anthony of Padua. 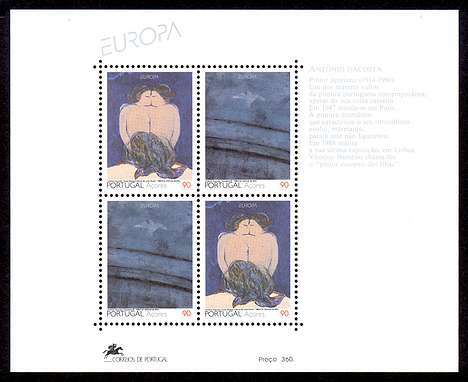 Used F-VF/VF with Superb cancels. #78 small tear (cat. $1.25), #86 has tiny thin (cat. $47.50), #89 small tear (cat. $100). Scott 2015 of the completely sound stamps is $709.50. 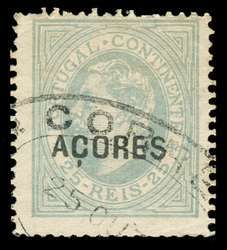 Scott #106, 1906 50r ultramarine King Carlos. Mint F-VF+. 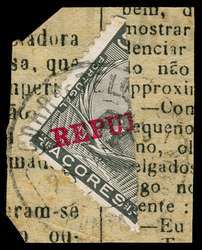 Scott #127 Unlisted, 1910 5r black Diagonal BISECT tied to piece of newspaper. Used VF. 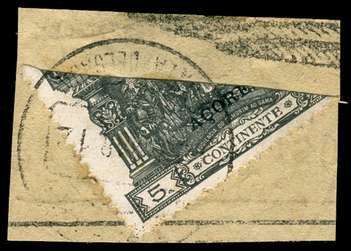 Scott #149 Unlisted, 1911 5r black Diagonal BISECT tied to piece of newspaper. Used VF. 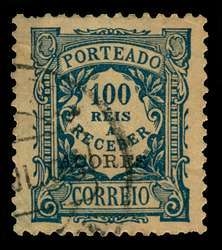 Scott #J7, 1904 100r dull blue Postage Due. Used VF. 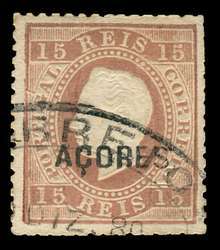 Scott #J13, 1911 50r carmine Postage Due. Used VF.